I've been spending time recently interviewing people who run unusual cultural and learning venues. Skill-sharing free schools. Community science workshops. Art spaces masquerading as laundromats and letterpresses. I'm fascinated by these places because of their ability to attract diverse audiences to idiosyncratic experiences, and I'm curious how they stay afloat. From a museum perspective, I think there's a lot to learn from these venues' business models, approach to collecting and exhibiting work, and connection with their audiences. In the past, I've highlighted a few--like 826 Valencia and the Denver Community Museum--that I think have already influenced the way many traditional cultural organization do business. I haven't found a centralized resource that is presenting information about these institutions, so I'm going to start writing more about them. In the next month, this blog will feature guest posts from a few of the people behind these innovative, quirky institutions, but in the meantime, here's a short list of six of my favorites to explore. This list is by no means exhaustive: please add your favorites (especially non-American ones) in the comments. Machine Project (Los Angeles, CA). One of my favorite places for a long time now. Machine Project is a non-profit storefront arts venue that hosts a dizzying array of eclectic classes, workshops, events, and occasional exhibits. It was started in 2003 and is run by Mark Allen and a collective of artists, many of whom have also been applying their talents by performing "interventions" at formal art institutions including LACMA, the Hammer Museum, and the Contemporary Art Museum in St. Louis. What makes Machine special is its brand of humor and accessibility, combined with a real dedication to experimenting on the borders of art, science, and ideas. In other words, they're not pretentious. At AAM, Mark and his compatriot Emily Lacy enthralled a packed room with a five minute song about Machine's hijinks. You feel like you could be a part of something awesome there (check out their FAQ for copious examples of this). Waffle Shop (Pittsburgh, PA). Want some waffles with your art? The Waffle Shop is a cafe and live streaming TV channel that serves a diverse audience of late night club-goers and locals in an urban neighborhood. It's run by Jon Rubin, an artist and professor of social practice at Carnegie Mellon, and his students. It's a fascinating experiment in connecting with "nontraditional" arts audiences and encouraging strangers to dialogue about diverse topics in a performative environment. Both staff and visitors host TV programs in the space that range from interviews to game shows to salon chair ministries. The Waffle Shop team also run other projects out of the space, including the Conflict Kitchen--a take-out place that serves food from countries that the U.S. is in conflict with (currently, Iran). Chicago Underground Library (Chicago, IL). If you're looking for inspiration with a collections focus, the Underground Library is a compelling experimental space dedicated to archiving all media produced in Chicago. They have an open collections policy, and they see media artifacts as objects that connect people--to art, to history, to politics, and to each other. The library is run in the lobby of a theater company by a group of volunteers led by Nell Taylor. Nell and the Underground Librarians are passionate about helping people see the relationships between media artifacts and lived experience in the city, and they spend a lot of their time soliciting artworks and publications from unlikely corners to flesh out their collection and honor the diversity of content production around Chicago. Whether a teen zine about punk music or a university journal, the Underground Library will collect it, catalog it, and share it in ways designed to help people learn more about their city and each other. Elsewhere Collaborative (Greensboro, NC). Elsewhere is another collection-based project, but in this case, the collection is the basis for artwork rather than the other way around. In 2003, writer George Scheer inherited his grandmother's thrift store and decided to turn it into an artists' center and museum. Elsewhere engages artists in residence who reinterpret elements of the thrift store into new works, which are then shared with the public. Their projects are an inspiration for anyone interested in looking at new ways to reinterpret a collection (especially a weird and overflowing one) and in doing so, bring together a community of artists and locals. PieLab (Greensboro, AL). A newer kid on the block, PieLab is a community center and pie shop in rural Alabama, started by a group of designers who believe that design can improve the world one small community at a time. PieLab resembles other community development projects: it employs struggling teens, provides local entrepreneurs and organizations with space and support, and brings together diverse folks. But it is also a symbol of a movement for third places that combine commerce, design and community. There are sites like this popping up all over the country, and some of the same young, creative, civically-minded people who might typically work in museums or libraries are the ones in charge. The amount of press and support PieLab has received from the design, business, and non-profit industries is worth noting for any cultural institution interested in truly putting forward a "community first" proposition (or for any individual ready to start her own mission-driven cafe). Streb Labs (Brooklyn, NY). If you are looking for experiments in taking a formal, traditional art venue and reconceiving it as a community space that attracts a diverse audience, look no further than Streb Labs. In 2003 Elizabeth Streb, a very successful choreographer, moved into a huge warehouse space in Brooklyn on a busy street and threw the doors open to locals, 24/7. As Streb explains, "SLAM is an open-access venue that models a new kind of artist-driven community institution. The doors of SLAM are never closed. Performances at SLAM are not stiff, class-coded, regimented affairs; they are neighborhood happenings where the company's longtime fans from the high-art crowd mingle with the at-risk kids from the local public schools and their parents. At the heart of this machine is the driving force of art and action, and the belief that art can provide a service to a community such that voters, taxpayers, and consumers will consider it indispensable." Check out their site and if you're inspired, listen to this fabulous 20 minute interview with Elizabeth on The Artful Manager blog. What non-traditional arts venues inspire you? Last week, I gave a talk about participatory museum practice for a group of university students at UCSC. During the ensuing discussion, one woman asked, "Which audiences are least interested in social participation in museums?" I immediately flashed to my work with art museums and staff members' concerns that older, traditional audiences will shy away from social engagement in the galleries. But in most cases, that fear hasn't born out; many older visitors enjoy the vibrancy of social events and are more than willing to share stories with other visitors in the context of a museum experience as long as it isn't overly technology mediated. There is another, surprising group that is much less likely to participate in dialogue with strangers: teenagers. Teenagers are often the target for participatory endeavors, and they definitely have high interest in creative expression, personalizing museum experiences, and using interactive or technological tools as part of their visit. Many teens love to perform for each other. They like to do and touch and make. But when it comes to socializing with strangers, their interest is incredibly low. This is true for two reasons. First, teens often have incredibly tight social spheres. They can be overly self-focused, and that focus expands only to a limited group of friends with whom they share their lives. They may love to text, take photos, and chat online, but they do so with a small group of friends (see, for example, Danah Boyd's research on how teens use social media to "hang out" with their friends, not to network or connect with strangers). In the lexicon of social capital, teenagers are much more focused on "bonding" experiences than "bridging" ones. Second, teens today are incredibly aware of "stranger danger." Their parents, teachers, and the nightly news remind them that strangers are stalkers, perverts, and kidnappers. Even though the primary threat to teens online is peer bullying, the media still often focuses on the dangers associated with interacting with strangers, especially strange adults. More so than teens in the past, teens today have grown up in a culture of fear around engagement with strangers. Check out how these girls reacted when I asked them to make social objects and talk to strangers in downtown Santa Cruz--they were terrified, but also curious and ultimately excited by the experience. So what's a museum to do--especially one that is funded to encourage youth and teen participation? I'm working with one such institution now, and we've had to take a bit of a reality check based on focus groups which have reinforced the fact that teens are interested in social experiences with their friends, but not so much with other visitors (even those with similar interests). I was amazed at how closely the results of the focus groups matched up with the findings from UC Berkeley's Digital Youth Research project, which offers both a white paper and incredibly useful book for free download. Based on this research, we're refocusing on ways to invite teens to engage with their own friends around museum content--to create and share photos, stories, and ideas with each other instead of with the wider world of the institution. We're trying to contextualize museum content to their social groups, so that groups of friends can use exhibits as touch points for shared experiences--much as children's museums design exhibits explicitly for family use and learning. We're also looking at simple staff training options to help teens feel more comfortable using the space the way they want to--loitering in large groups, goofing off, doing whatever. One of the positive opportunities for museums comes in the fact that so few public spaces are open to use as social hangouts, and few parents allow kids to loiter on street corners. Museums could potentially become "safe" places for kids to do something that is increasingly difficult: spend time in person with their friends (and yes, the research shows they would rather hang out in person than online but are often restricted by parents from doing so). Some of these efforts will be harder to track than more public participatory projects; while staff can count the number of comments left on a museum kiosk, we can't easily count the number of personal text messages sent among a group of friends. We're still trying to figure this out, but ultimately, I feel like we'll have much more success creating opportunities for kids to share with their friends than forcing them in uncomfortable positions where they have to expose their preferences and creative expression to people (especially adults) they don't know. But we're also thinking about ways to gently invite teenagers into bridging experiences with the unknown. Teenagers, like all humans, balance out their self-interest with curiosity about the rest of the world. And while many teens are focused on being where their friends are, listening to what they listen to, liking what they like, they also pursue personal passions. In some cases, they do so on their own, "geeking out" on music or science or web design at home, away from their friends' judgment. These personal pursuits are one of the most common ways that teens pursue bridging experiences; if someone has an intense passion for a particular novel, she might get involved with a fan fiction website and start comfortably communicating with other fans she didn't know previously. My guess (and one I'm looking forward to testing) is that teens may be more open to this kind of bridging experience if it doesn't require personal exposure in front of their friends. If a group of teens are on a school field trip to an art museum, and a 15-year-old boy finds himself totally thrilled by landscape painting, he may not feel comfortable sharing that immediately with his friends. But he might want an opportunity to geek out on his new interest later on his own or in a private interactive space. I'm really curious to see whether there's a difference in what teenagers do when presented with opportunities to express themselves performatively (i.e. by wearing a button indicating a preference or making a video in a public gallery) vs. privately. The way a museum integrates into teens' social lives might be quite different from the way it integrates into their personal ones. What have you observed in your own institution with regard to connecting teens to content experiences via their social and personal lives? What have you observed in your own life as a teen, parent, or teacher? Today is my birthday. It's been an intense year - finishing the book and spending lots of time on the road working with cultural institutions. Plus climbing trips, a new obsession with beach volleyball, and the death of a treasured pet and friend. Today, I have a request for you. My book, The Participatory Museum, has done incredibly well so far, but there's a problem: the interactive components aren't working. When I released it in March, I launched a simple website to host all the book content and to support discussion around it. I wrote the book with thoughts, case studies, and stories contributed by many of you. The book is still open to new ideas and stories. Your reactions, experiments, and new case studies can inform future readers both online and in subsequent print editions. The problem is that at least so far, the tools I've provided for discussion on the book's website are not gaining traction. They're simple--you can comment on any given chapter, or you can write a review of the whole book. Only one person has added a comment to a chapter (thank you, Juline Chevalier! ), and a few have written reviews, mostly after they sent me a lovely email and I asked them to consider translating their enthusiasm into a review. I imagine many of you have read the book and have marked certain passages that excite or frustrate you. I'm sure some of you, like Juline, have taken ideas and tried them out or tweaked them for your own institutions and programs. And so today, I'm asking you for a birthday present. If you have a story or comment or idea to share related to a chapter, please do so. If you want to review the book on Amazon so that more people understand what it's about, that's great too. I think once there are a few comments for each chapter, people will start to see it as a more useful resource and will be generally more inclined to share their own thoughts as well. And finally, if you have ideas for better ways that I could support discussion on the site, please leave a comment and let me know. I started with super-simple tools because I wanted to see where people would want to take it. I know that coming to a website and commenting on a chapter is not entirely natural to the way people read and use books. I'm open to other options or design changes and would love to hear what you have to share. Thanks in advance. I can't wait to "unwrap" the stories and ideas you gift me. Let's say you want to make a documentary about the World Cup. Or sail around the world. Or produce an art exhibit with elementary school students. Or build an open-source PCR machine for copying DNA. How would you fund it? Project description. This is typically a video plus text, although some projects just use a simple image instead of a video. Project creators can also write updates (a kind of project-specific blog) to share either privately with backers or openly with all. Funding goal. Kickstarter is an "all or nothing" funding scheme. If you make or exceed your goal in the timeframe you set, you get the money. If not, the backers' credit cards are not charged. Kickstarter makes money by taking a percentage on projects that succeed. Pledge levels. While backers can fund you at whatever level between $1 and $10,000 they desire, most Kickstarter projects offer rewards at discrete pledge levels to motivate people to give specific amounts. For the most part, Kickstarter projects are managed by young, creative individuals with small projects (and smallish funding goals) in mind. When I first started exploring the site, I assumed it was mostly a place for charismatic hipsters and a few star artists with enough social media savvy and clever video production capabilities to produce enticing pitches. But then I started finding more humble projects related to broader issues, and I began to see Kickstarter as a potentially fascinating space for museums and cultural institutions. Why should cultural and arts organizations care about Kickstarter? Kickstarter is a symptom of changes in donor culture. They are tapping into a large audience of people who don't care whether their donations are tax-deductible or not. Kickstarter backers aren't investing in companies or projects. They are making donations--in most cases, to entities that are not non-profits. These backers are excited by specific, near-term projects and want to support them directly. These are people who like to have a personal connection to a specific project and may be less interested in museum-style donor levels that are more about general (and vague) support for the institution. Kickstarter may be a good place to fund small experiments or to jump start campaigns. The all-or-nothing funding approach makes many project creators conservative about their ambitions. A documentary film crew might use Kickstarter to pay for travel costs, or a dance troupe to pay for recorded music so they don't have to hire musicians for their live performances. While Kickstarter is not likely to be the best solution for a huge fundraising project, it could be the perfect way to fund a discrete part of a capital project with high public appeal or a small wacky experiment that doesn't fit into the budget. To illustrate some of the key elements of a successful project on Kickstarter, I want to compare two projects that look very different on the surface: Jim Babb's Socks Inc. game and the Neversink Valley Museum's capital campaign launch materials. Please take a look at their pages and then come back. In their presentation, these projects appear completely different. Jim's is a fun game involving sock puppets. He has a very catchy video pitch and pledge gifts that include things like a "sock clone" of you ($200, three backers so far). The museum's page is much simpler. There's no video, just a picture of the planned new community cultural center. The pledge levels include membership to the museum and traditional donor gifts--books, tickets to a party, naming opportunities. At first glance, I assumed that a project had to be hip like Jim's to succeed on Kickstarter. But both these projects made their funding goals ($11,000 for the museum, $6,000 for the socks), and in the case of the museum, director Seth Goldman told me they raised an additional $7,000 for their campaign from less web-savvy people who preferred to write checks instead of donating online through the Kickstarter site. They picked sensible funding goals. Seth needed $25,000 for the capital campaign materials, but he felt that $10,000 was more reasonable in terms of what he could drum up online. After researching the fees and determining the true costs of all the gifts, he set the amount at $11,000 so they could net $10,000 for the campaign. Similarly, Jim focused on what he actually needed (and it looks like he will far exceed his goal in the time allotted). Not all projects are successful--I recommend this blog post for a sobering look at what happens when a project doesn't quite make it. They developed pledge levels that were scalable and supported the project appropriately. Some projects on Kickstarter offer such fabulous thank you gifts that it's unclear how the creator will actually recoup any money for the project. Jim and Seth were very smart with their gifts and pledge levels. Jim noted to me that $25 is "the sweet spot" for donations, so that's the level at which he offered his first physical item (a patch featuring one of the socks from the game). Seth made the same decision--at $25 you get a book as well as a museum membership. Both of these projects offer gifts at levels below $25, but they're "free" for the project (membership in the museum's case, digital thank you's and behind the scenes blog access for the socks). Jim also told me that "the most important gifts to think about are between $25 to $250, since people donating amounts higher than that are contributing because they really want to support the project." In the museum's case, Seth capitalized on this by inviting funders at the $200 to a party hosted by a board member on the capital committee. As Seth noted, "we reversed the party concept. Instead of saying there's an admission fee for the fundraising party, we'll make it if you give $200 on Kickstarter the reward will be an invite to the party." They were willing to aggressively "beat the drums" to promote their projects. Both Jim and Seth made it clear that you have to do the work marketing your project to be successful. For Seth, that meant emails and frequent Facebook updates out to museum members, whereas for Jim it involved a Twitter campaign and some guerrilla marketing to players of his past games. Jim noted that only 20% of his backers were people outside of his professional and personal networks, so it's essential to focus on people you know and not on "going viral." Jim told me "people are much more likely to check out a project and donate to it if a personal friend encourages them to pledge, so start there and encourage people to share in their communities." In Seth's case, this paid real dividends as the adult children of some museum members began donating and spreading the word. In one case, a man in Texas donated $1,000 to the campaign. Seth contacted him to thank him and express his incredulity that a stranger from far away would make such a gift, but then the man explained that his mother was a museum member and that she loved the museum and he wanted to do this as a gift for her. She had forwarded the link from the museum newsletter to her son, and he had taken it from there. People who pledge have the opportunity for ongoing engagement with the project. The thank you gifts are invitations for deeper involvement over time. For Jim and the sock puppets, backers have the opportunity to test the game and eventually develop new levels and missions for other players. At the Neversink Valley Museum, every backer at the $15 level or higher received a museum membership. As Seth commented, "I can give you a better answer next year for how fabulous this is. A lot of people who wanted to come to the party got all the benefits below $200… so now they’re all members of the museum. So we’ll see how connected they are to the institution, will they renew their memberships, and will they donate above basic membership when it comes time to renew." The hope is that Kickstarter is the beginning not just of a project but of new relationships that can support the organization over time. Could you imagine using Kickstarter at your institution? What do you see on the site that helps you think about how your organization raises money or communicates with audiences? How Can You Attract New Audiences Without Alienating Your Base? "We want to find ways to make our institution more participatory and lively." "We want to cultivate a more diverse audience, especially younger people, and we want to do it authentically." "But our traditional audience doesn't come for that, and we have to find a way to do this without making them uncomfortable." Audience development is not an exercise in concentric circles. You can't just start with who you already have in the middle and build infinitely outward. In most cases, growth means shifting, and shifting means that some people leave as others come. This is incredibly scary. It requires trading a certain history for an uncertain future--a nerve-wracking prospect no matter the situation. It's particularly scary if your institution relies primarily on private donors, members, and gate sales to cover operating costs. When funding is tied to a specific subset of your audience, you get protective of them, even if they are not the people most likely to ensure viability and sustainability in the future. If someone enjoys Arts Event A because it’s social, informal, energetic, fun, and hip, why should we expect her to also enjoy Arts Event B if B is individual, formal, quiet, serious, and traditional (at least in its presentation, if not artistically)? While Peter was writing about youth, this approach is often also used to invite in ethnic groups. Many museums offer programs for specific days like Dia de los Muertos or Chinese New Year to attract new audiences. This "parallel" strategy even applies to experiments in new forms of gallery interpretation. Most museums that offer interactive exhibits, media elements, or participatory activities offer them alongside traditional labels and interpretative tools. I employ the parallel strategy all the time in my work. It's the easiest way to get new experiments started. It's always easier to sell a new visitor experience element as an additive element rather than a replacement for what came before. But there's a big problem with the parallel strategy. Parallel programs require additional dollars. They are often segregated to specific grants, programs, or departments rather than being integrated as core offerings. If the traditional program remains sacred and new visitor experiences can only be additive, parallel programs will come and go with grant funding and the fundamental experience will not shift. At some point you have to make some "or" choices. You can't always do "and." At the Oakland Museum, a longstanding successful parallel program, the Days of the Dead community exhibition and celebration, became a touchstone in the museum's recent overhaul (read more on this in Chapter 8 of my book). As staff members talked about their goals for the redesigned museum to reach more diverse and localized audiences, they repeatedly said, "we want it to be like Days of the Dead." As a parallel program, Days of the Dead is hugely successful in terms of audience numbers and engagement, but not all staff members felt comfortable with its radically co-creative approach. As project director Evelyn Orantes commented, "This is a program that challenges the basic ideas about how art is displayed." When the staff embarked on the institutional redesign, they debated how to embed the radical Days of the Dead approach into more aspects of the visitor experience. The result is an institution that is impressively committed to audience voices, diversity, and participation--not just in one program, but in the label text, the exhibits, and the overall visitor experience. The parallel program's success gave them the confidence to take a bigger risk across the whole institution. And I guess that's the key for me. Parallel programs are a great way to get started with a new audience or new interpretative strategy. But once you can show that they really work, maybe even succeed beyond your wildest dreams, they shouldn't be a dead end. They should boost your confidence (and your board's, and your colleagues') that you can make changes to your core program. They should be a starting point for a conversation about how the whole institution might grow and shift. And that change might alienate some traditional audiences. Staff members at one museum said to me directly, "We don't want to be the museum for ladies who lunch anymore." If you don't want to be that place, you have to be willing to let those ladies go--or at least, not to put them at top of mind when planning future programming. How do you approach this problem of frustrating traditional audiences when trying to move in a new direction? 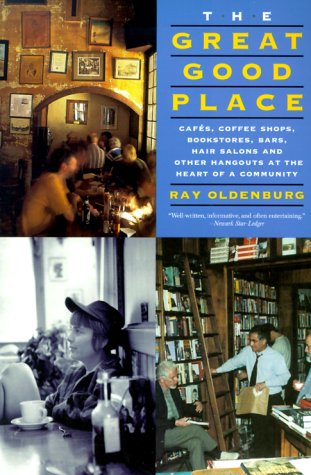 This is a bonus installment of a book discussion about Ray Oldenburg’s book The Great Good Place. Every Tuesday in June, this blog featured a guest post examining some aspect of the book. Then I received this commentary from Elaine Heumann Gurian, a museum hero of mine who has been following the book club--and I had to include it. Thanks to ALL the guests who have helped make this book discussion a success! I have been using quotes from Ray Oldenburg’s book The Great Good Place in my own writings for quite a long time. I had became convinced (around 1996) that there was something important about museums as socializing spaces that should be further explored. I went off to read Jane Jacobs[i] and William Whyte[ii] who both understood and wrote about the importance of strangers interacting with each other in public outdoor spaces. Their seminal writing and research first took place in the 1960’s. I also read books by various architects who were writing about museum buildings and their uses but they were mostly interested in the functioning of the building itself or how buildings made visitors feel. At the time I did not find any architectural writers who wanted to talk about the promulgation of stranger interaction within their spaces. Then I stumbled upon The Great Good Place while browsing in my local library. The book was a revelation and an affirmation that gave credence to the importance of strangers meeting each other inside establishments outside the home as a method of community building. I was excited. The Great Good Place has since become treated as a mandatory museum studies touchstone. Many people use references to “third spaces” as short hand when discussing any sites that are neither home nor offices. Often they do so without reading the book. And saying the phrase “third space” has become synonymous for other phrases like “forum, meeting ground, scholar’s cafes, seating amenities, and entrance halls” none of which are synonyms at all. Because of the casual use of the “third-space” phrase I found myself believing that Oldenburg’s book was foundational. Having read it carefully the first time, I did not reread it again counting on my memory when referring to it. Now, thanks to you, Nina, and the Book Club on your blog, I have reread The Great Good Place and am disappointed: it does not really apply to museums very much, and Oldenburg is more prescriptive and judgmental about what he thinks constitutes the third space (that he has been instrumental to getting the public to acknowledge and to value) than I would like. Oldenburg is writing about space that encourages repeated interaction between frequent customers who end up acknowledging each other so that former strangers become familiar acquaintances. Jane Jacobs would call them “regulars”. The third space he is describing is to be found on a continuum of important civic spaces each of which accomplishes different important tasks. Let me describe one of these other spaces which I call “congregant space”. It encourages a lower threshold of human interaction and does not require overt human interaction to be effective. If well designed these inside and outside public spaces allow strangers to view the “other” as fellow humans who happen to the same location. The importance of congregant spaces can be better understood in times of troubles when authorities intentionally or inadvertently permit their citizens access to fewer and fewer such places that are considered safe enough to freely traverse. I believe having accessible spaces seen by the public as belonging to all is essential for civic health. If you mark off one meter square on the ground you will see that it is a very small space. Only one person can comfortably occupy it at one time. It is clear that any human activity that takes place in a one meter space is highly dependent on where that meter is situated and what is adjacent to it. A meter set in a dense forest not only looks different from one in the airport but is peopled much less often. All this so far is obvious. What is less apparent is that some places as small as a meter square can contribute to civic peace. Their presence makes the world a little bit better and together with other such meters help keep us collectively safer. Yet these places, which I call “congregant spaces,” are ordinary, seemingly unrelated to each other, and ubiquitous. In each, strangers can safely meet; participate in the same activity at the same time; see, and even brush past, one another; and yet need not talk to or even acknowledge each other. Most importantly, people feel safe enough to enter or walk through these spaces. The absence of such safe places is symptomatic of a community plagued with civic disquiet, even violence and upheaval. We sense the importance of these places when they’re absent. It is easy to understand why terrorists target them to promote widespread fear. …. When people have easy opportunities to view each other, they get accustomed to one another. And when everyone can use the same spaces and services, we signal a silent welcome to each of the strangers we meet along the way. Even better, safe public spaces which encourage learning and debate (lecture halls, museums, libraries, etc.) can move us further -- from mere passive acceptance and civility to understanding and even empathy. 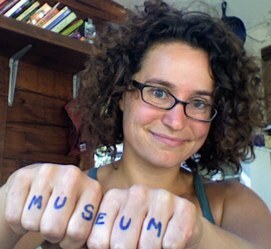 Museum congregant space might be renamed “Museum Space 2.5” in honor of Nina’s blog. 2.5 might place it midway between the second space of work and the third space described in this book. Perhaps we in museums could learn to intentionally value museums as safe 2.5 spaces where strangers can see each other without needing to interact. Space 2.5 is a precursor to Oldenburg’s third space. This lower threshold requirement for stranger interaction in space 2.5 does not lower the importance of the third space as Oldenburg conceives of it but I would contend space 2.5 is more germane to public civility than is the third space which is useful in local community building. And with a continuum of space use, I suggest that museums that create space 2.5 will be surprised to see opportunities presenting themselves for also becoming the 3rd space of their neighborhood. …a sense of place, are ecologically sensitive, put reliance on foot rather than auto traffic, are utilized over many hours each day and offer a mix of activities which appeal to many. They maintain that the juxtaposition of spaces that forms mixed-use environments must be present if community building is to succeed. Jacobs adds the acceptance of “unplanned and ad hoc use” as another necessary component. The translation of these ingredients into museum design must be intentional. The admission’s barrier remains the single largest impediment to welcome. But assuming that the museum has free admission, the designer must consider the location, quantity and design of amenities like seating, hours of availability, encouragement of perambulation, views that encourage people watching, a multiplicity of programs and activities so that the user enters for multiple reasons not just gallery viewing. Think train station and airport. These spaces consider the placement and variety of seating and services, the ease of using the toilets, the hours that they are open, the security they impose and the unexpected but allowable activities that can take place like card playing and sleeping. In trying to make the waiting period welcoming, safe and lucrative to the service providers they create civic space. To the extent the space feels unattractive, confusing or dangerous, or the service providers are unhelpful or discourteous, the use of their services decreases. These and other examples of indoor spaces (malls and libraries for example) might help museum staff understand the difference between the construction of large open spaces (used for rental revenue and not much else) and space 2.5 that add to civic wellbeing. For me, Jane Jacobs and William Whyte are heroes we should all be reading. While we thank Oldenburg for his input, we need to urge designers and administrators of museums to create more 2.5 spaces that intentionally welcome all in physical and programmatic ways. Space 2.5 is essential and the third space while nice to have can evolve down the road. [i] Jacobs, J. (1961). The death and life of great American cities. New York, Random House. [ii] Whtye, William, (1979) “A Guide to Peoplewatching,” in Urban Open Spaces, Lisa Taylor (Ed. ), New York: Cooper-Hewitt Museum. [iii] “One Meter Square” in Sacco, Graciella, M2, Museo Castagnino + MACRO, Rosario, Argentina, 2009. [iv] Gurian, E. H. (2001). "Function Follows Form: How Mixed-Used Spaces in Museums Build Community." Curator 44(1): 87-113.